Exciting unambiguous ETG, studying its threshold, beta scaling of plasma transport, effect of magnetic shear on ETG and understanding non linear features like Zonal flows and Streamers are various exciting problems which needs dedicated effort. We believe that unfolding these physics issues in LVPD will greatly contribute to fusion fraternity because of their relevance to fusion plasma. Another important physics program running in LVPD is on understanding the filter plasma. This comprises of study of trapped particles, energetic particle diffusion across magnetic field and associated drifts, excitation of whistler and lower hybrid kind of instabilities associated with energetic electrons, instabilities associated with electron temperature anisotropy and study of wave – particle interaction in the belt region. 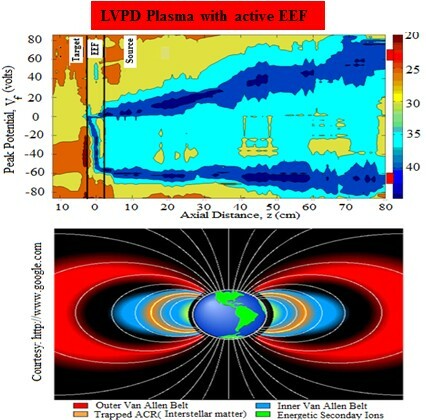 The energetic belt region in LVPD mimics the Van Allen belt regions of earths magnetosphere. This possibility is under investigation.